It was indeed Stransky Park at 17th and Lake St. behind BryanLGH West. 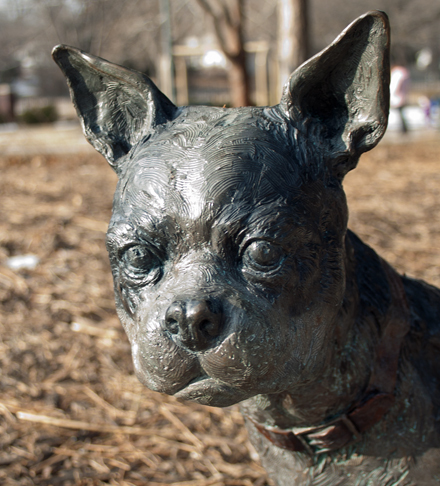 Specifically, it was the dog statue in the park. Good going Mr. H! This means that if Mr. H is first to correctly guess the next Where in Lincoln is this photo, we will get him a pogocard. That’s a good photo… well done, Mr. T.
Thanks Matthew Platte! I took this a few weeks ago using a less than ideal lens (18-55mm). I’ve got a new nifty 50mm that would do well with this particular composition, but this weekend I was too lazy to go out there and shoot it again. I have to disagree. Bad photo. Mainly because I don’t know where it is. Way to ruin my Monday morning Mr. T. Ga! Okay it’s a fine photo. Heh heh, and I was worried this one might be too easy for you. Stransky Park, 17th and Lake St.
Wow, background really threw me off there. 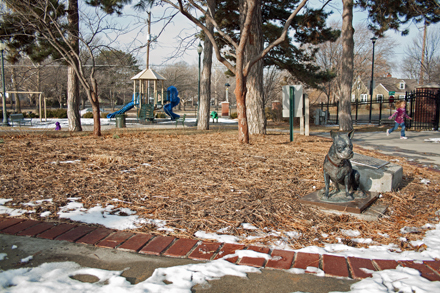 I knew there was a dog statue at Stransky but it looks like an acre in the back of him in that pic. Oh…my…goodness. I’ve patted that dog on the head. Those fuzzy pine needles really look like hay. Good job Mr. H.